Buttermilk benefits are here, give it a read! Buttermilk (chaas in Hindi) is a widely popular drink all over the country and rightly so since it has a lot of health benefits. No wonder ancient Ayurvedic texts recommend drinking it. No matter if you are lactose intolerant or suffering from blood pressure issues or conscious about your weight loss regime, a cup of buttermilk can do nothing but good to you. What are the benefits of drinking buttermilk? Buttermilk is a yogurt based drink and is very useful in fighting acidity and related symptoms. If you often have acid reflux after your meals, start including buttermilk in your diet. A glass of it after your meals will significantly improve digestion and prevent acidity. Buttermilk is a natural therapy for preventing constipation and other stomach problems. Regular consumption of buttermilk helps to ease this condition since the adequate amounts of fibre in it facilitates the bowel movement. With the summers around the corner, it is time to give up hot soups, tea, etc and shift to a more appropriate and healthier drink for summer. Buttermilk has a cooling effect on the entire body, especially on the digestive tract. 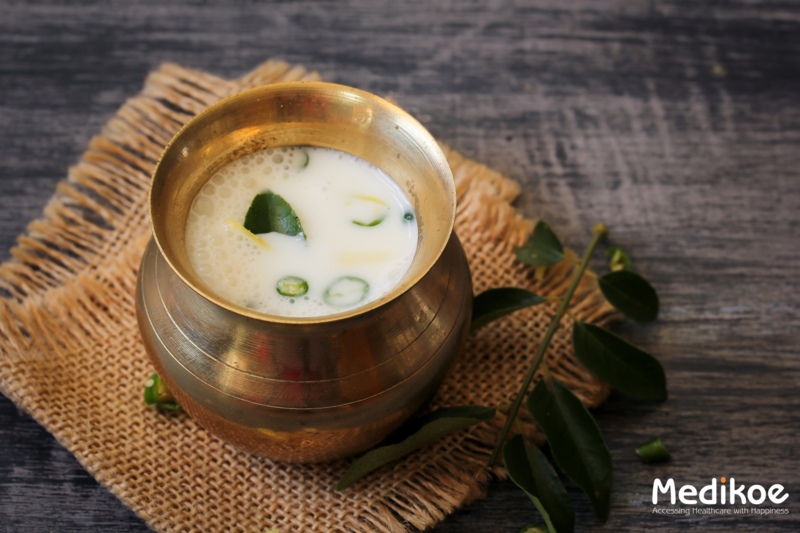 So next time you feel your stomach burning due to spicy or hot food, gulp down a glass of buttermilk for instant relief. It is essential to keep the body hydrated, even more so in summers. Dehydration can lead to various ailments and diseases and is generally uncomfortable. Buttermilk is full of electrolytes and prevents water loss from the body. It also indirectly helps in fighting against summer diseases like prickly heat. The riboflavin in buttermilk helps in food to energy and is also very important in the secretion of hormones. Riboflavin also enhances the liver function and promotes the detoxification process. Buttermilk is very rich in calcium and has less to no fat. So if you want to fulfill the daily calcium requirement of your body without putting on some extra mass, buttermilk is a great choice. It also contains many other vitamins and antioxidants which are great for your health. Buttermilk has some particular bioactive proteins that lower the cholesterol level in the body. Besides, it also has some antifungal, antibacterial, and even anti-cancerous properties. Having buttermilk regularly can do wonders for your body, especially the digestive system and with summers around it is highly recommended to have at least a glass of it per day.